WINCHESTER — Chief Peter MacDonnell reports that the Town of Winchester has issued a snow emergency for the town starting tomorrow. The snow emergency will be in effect from Thursday, Feb. 9 at 12 p.m. through 8 a.m. on Friday, Feb. 10. • All residents are advised not to travel during these hours if at all possible. • All parked vehicles are to be removed from the public roads and onto private property to allow for snow removal. • Any vehicle unable to park on private property can park at the Town Hall/Jenks Center parking lot (109 Skillings Road) or the Aberjona Drive parking lot (off of Waterfield Road and near Winchester Center train station) for the duration of the storm. • Any vehicle not removed from the roadway will be subject to ticket, tow, or both. • When shoveling snow or walking outside for more than a few minutes, dress appropriately, with exposed skin covered, and wear a hat and gloves. • Ensure that your home or business sidewalks are properly shoveled, and place salt or ice melt to prevent people from falling. • Help out the Winchester Fire Department by shoveling out your nearest fire hydrant. • ALWAYS clear the tailpipe of a vehicle that is buried in snow BEFORE you start or warm up the vehicle. Failure to do so can be fatal for those inside the vehicle. • Keep stocks of batteries on hand for radios and flashlights in case of a power outage. • Keep space heaters at least 3 feet away from bedding or combustible materials. 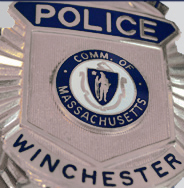 For emergencies, dial 911 or contact the Winchester Police Department at 781-729-1212. For snow removal issues please contact the Winchester Department of Public Works at 781-721-7100.